Update from Foster home. 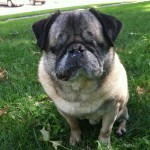 Beau had both eyes removed due to a severe condition. He is very friendly, house trained and can get excited which is great for being 10! Great with kids and other pugs. He gets around really well for being blind. Would be fine in an only dog household. He can do a couple of stairs but more then that a gate or a closed door should be in place.